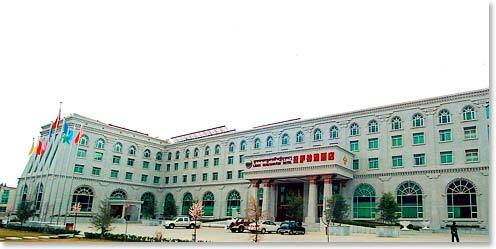 Tibet Tour Dispatch: October 30, 2012 – Welcome to Tibet! October 30, 2012 – Welcome to Tibet! Our guide, Mr. Pingstso, who is Tibetan, collected us at the airport. The trip through immigration was very efficient. Our group visa was reviewed at least five times, including as we left the airport. Then, we stepped out into another of the bright, sunny days that have characterized our trip so far. 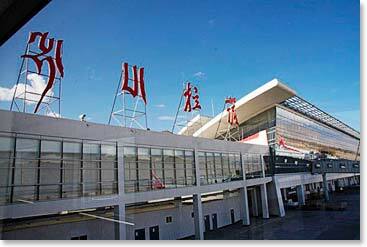 The airport is 70 km from Lhasa. We travelled on new roads, four lane divided highway with new bridges and high speed train lines arching over the road. The road was lined with many new buildings and characterized by broad intersections. Mr. Pingtso briefed us not only on what we were seeing, but on our expected behavior: No photos of police or military. He also informed us that very few tourists were allowed in this year. The Chinese government may have increased restrictions on tourists but has also been improving the infrastructure and other amenities. 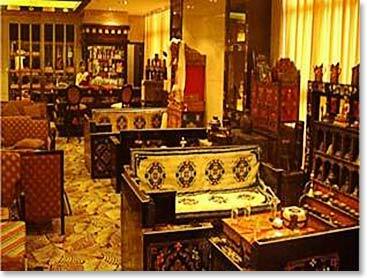 We are currently at the Manasarovar Hotel. This is a lovely, cavernous hotel that appears to have very few guests but could easily handle 10 times the number here, now. We are certainly the only western tourists. The main areas of the hotel are not heated, but our rooms are comfortable. Gerry and I love this hotel. It is right out of a movie. Personally, when I walk down the hallway, I think it would be the perfect setting for the Tibet version of The Shining. In the end, we were well fed considering that we didn’t speak any Tibetan and the waitresses spoke no English. The only real glitch was that we ended up with 5 orders of dumplings instead of 5 dumplings (this was apparently the translation of ‘one each’). Our entrance to the hotel restaurant was greeted with excited panic and some feverish phone calls. We ordered soup. Some time later, a young man who did work at the hotel and spoke some English, arrived and we ended up with 5 orders of dumplings. I think we were doing just fine with the waitresses. 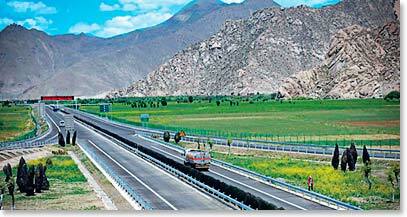 The first highway in Tibet, Lhasa-Gonggar Airport Highway was completed in July, 2011 - with a length of 38.7 kilometers, the new four-lane highway links Gonggar Airport to downtown Lhasa.